The north is considered an un-auspicious region and needs protection from real and imagined enemies, fiends and demons. In Japan, the monkey's role in guarding against demons originates from the Japanese word for monkey (猿, pronounced saru), which is a homonym for the Japanese word "expel" (去る, also pronounced saru). The latter word means to "dispel, punch out, push away, beat away." See the haiku of Issa below. was another powerful deity of the North-East (ushitora, ox-tiger). 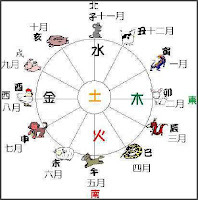 His heavenly direction changes with every year and if you do something to displease him, he will kill seven people (nanasatsu 七殺) (even your neighbours) to show his wrath. There were four days, one in each season, in his honor where you had to be especially careful not do anything to anger this deity. krodha-devata, krodhadeva - minor Indian deities, 10 deities of direction. In this group, Fudo Myo-O governs the North-East. Let us look at some Fudo Myo-O, facing North ! At the temple Fudo-Ji 不動寺 in Kyoto. It is also called Matsubara Fudo 松原不動. 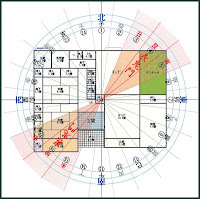 Emperor Kanmu Tenno 桓武天皇 had four "Iwakura" Sacred Stone Areas constructed in Kyoto, one for each heavenly direction. This temle was in the south : 南岩倉　明王院不動寺. Today the temple is rather small and looks almost like a normal old house. 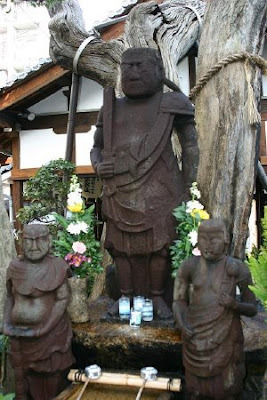 There is also another temple in South Iwakura, Konzo-Ji (Konzooji) 金蔵寺, with a famous "Ichigan Fudo" . This temple is on the northern side of Matsubara Road. 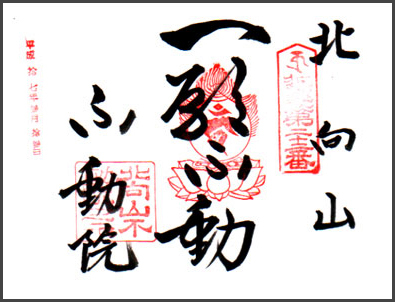 Its original function was to protect the capital against demons and evil from the the Northern Side. 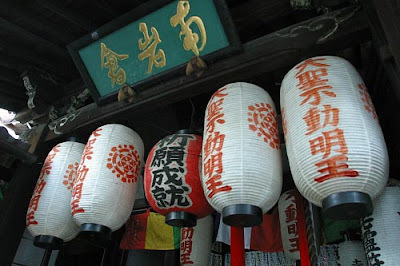 It is in the 鬼門　Kimon direction to protect the Imperial Palace.
. Kinki Fudo Pilgrimages . 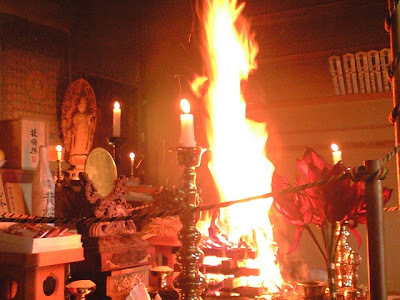 This temple had been burned down during WW II and even the Fudo statue as we see it today shows signs of severe burning. It now stands facing North under a large camphor tree. 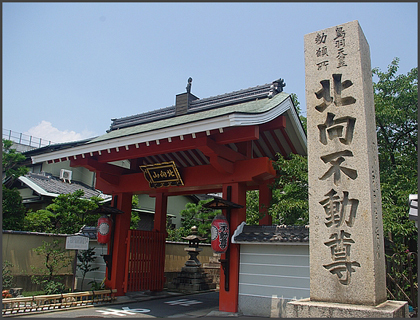 The "Fudo facing North" has its own hall 北向き不動堂 to the left of the main gate. It was re-constructed in the year 1779. Now the roof tiles have been changed to copper. This was in the North-East direction of Kamakura, the old capital of Japan. A long time ago, the Ikuta River flowed south from the intersection of Kano-cho along Flower Road. One year, when there was a severe rain, people moved busily about on the riverbanks, stacking sandbags to reinforce weak spots. "Is the bank OK over there?" "Hey, over here, the bank upstream is about to break!" Several people grabbed sandbags and rushed upstream. The rain, continuing for several days, caused the dirty water of the Ikuta River to increase, and the flow was strong. There were several spots along the banks that looked like they would break soon, but as night fell there were no more sandbags left for reinforcement. The exhausted people went into the watch lodge on the hill by the bank, where they sat with extreme fatigue. Then they heard sounds of something dragging, then a booming sound, then something rubbing against something else. It sounded like something heavy was being dragged; the sound came from the direction of the river. Another dragging sound, then the sound of something heavy falling in to the water, then water gurgling… It sounded as if something was sinking into the river. However, the villagers were too tired to go back outside, and one by one fell asleep. When morning came, they found that the sky had cleared and the sun was shining. People got up, went outside to look at the banks, and exclaimed. "Oh my, look there! There's a big tree stuck there, and the bank looks ready to give way!" "The bank has been reinforced with a big rock." "Look, the Kitamuki-Jizou is on top of the rock!" "That sound we heard last night was the doings of Kitamuki-Jizou. He came to fix the weakened bank. He protected our village." The thankful people built a hall enshrining Kitamuki-Jizou west of Ikuta River. It was built in 1484. 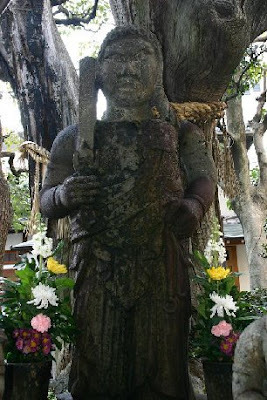 The statue of Fudo Myo-O has been carved by Jigaku Daishi more than 1100 years ago. He built the temple to protect the region from evil influence in the unlucky "Demon Gate" (鬼門 kimon) Northern direction. He carved the statue and placed it into a cave of the cliffs around the waterfall. 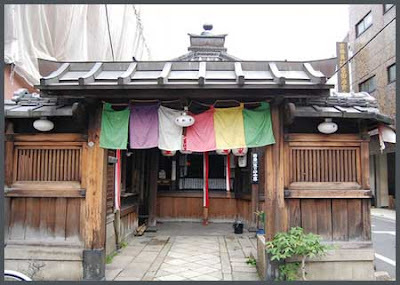 Located at Kyoto’s northeast corner , where the front spirit gate called Omote Kimon 表鬼門 used by demons is believed to stand, Sekizan Zen-in has been worshipped as the temple to protect the citzen from bad luck coming through that gate. 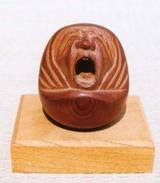 one mask comes in a box, the other on a votive tablet (ema). They prevent evil influence and disasters. 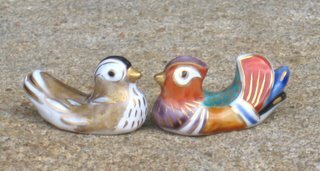 They must be hung in the demon-avoiding corner 鬼門 of the home. 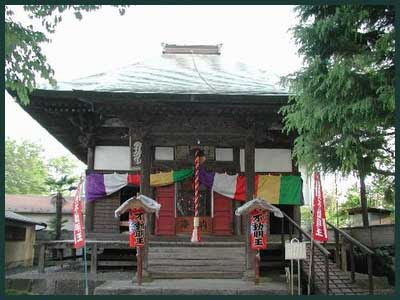 The Zelkova tree between the Hachiman shrine and the Myojin Shrine is supposed to ward off evil. Once three farmers said they could not pass there with their horses and tried to uproot the tree by pulling it sown with ropes. All three of them soon died at a young age.